According to hypebeast.com, athletic footwear powerhouse New Balance has produced a pair of sneakers celebrating the 30th year anniversary of the founding of rock group Joy Division. 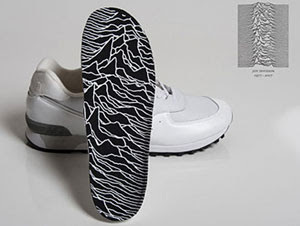 Mostly white and in the style of New Balance's ubiquitous gray running shoes, the Joy Division kicks feature art from the band's first major release, Unknown Pleasures, embroidered on the tongue tag and printed on the insole. No word yet as to if or when the shoes will be available for purchase in the United States, though rumor has it that they're being featured in shop windows in some parts of the U.K.
Waist High side note: In 2000, Q magazine ranked Unknown Pleasures at #19 in its list of the 100 Greatest British Albums Ever.